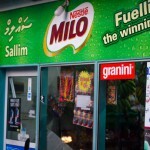 The pair are accused of illegally “recruiting” migrant workers to bring to the Maldives. They were apprehended yesterday from Addu City and Vilimalé in joint operations conducted by the immigration department and the police. Two foreigners were arrested on Monday on a charge of human trafficking. Authorities say they suspect the involvement of locals, but declined to reveal whether any Maldivians have been arrested yet. Hassan Khaleel, the immigration department’s spokesperson, told The Maldives Independent that two foreigners are accused of illegally “recruiting” migrant workers to bring to the Maldives. They were apprehended yesterday from Addu City and Vilimalé in joint operations conducted with the police. “Mass recruiting of foreigners can only be done by locals with a license. However, foreigners are bringing in other foreigners who will earn such recruiters a higher commission than those who have a license,” he said. He declined to reveal the nationalities of the pair. A Maldivian has not been prosecuted for human trafficking so far since the enactment of the Anti-Human Trafficking Act in December 2013. In the first criminal prosecution for human trafficking in the Maldives, three Bangladeshi men were charged in mid-2015. A government report in 2011 revealed human trafficking to be the Maldives second most lucrative industry after tourism – worth an estimated US$123 million a year. 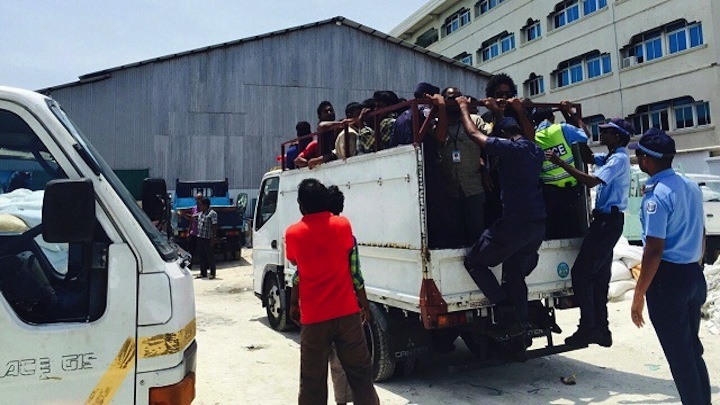 Some 124,000 migrant workers are believed to reside in the Maldives, including more than 30,000 undocumented workers. In a third case on Monday, Khaleel said the immigration department discovered a garage where undocumented workers live. Upon questioning, a foreign worker in charge of the garage said he was a victim of human trafficking. “We have now handed the case over to the police. The immigration identifies such cases and the police will decide whether they are victims or traffickers,” he said. In 2014, the authorities investigated five cases of human trafficking involving 20 foreigners, Khaleel noted. The police identified four migrant workers as victims of trafficking. 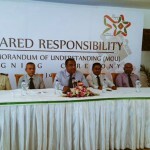 The police meanwhile said yesterday that anti-human trafficking efforts will be scaled up across the country this year. In July, the Maldives was placed back on the US State Department’s tier 2 watch list for human trafficking over lack of progress in the government’s anti-human trafficking efforts. If downgraded to tier 3, the lowest tier, the Maldives may be subject to non-humanitarian and non-trade sanctions. 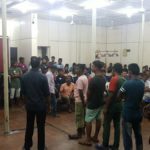 In late March, migrant workers in Malé attempted to stage a protest following the murder of two Bangladeshi nationals in a spate of violence against expatriates. The demonstration was called off after the department of immigration threatened to cancel visas and take action against the employers of the migrant workers participating in the protest.